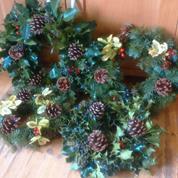 Create a fabulous Christmas wreath to hang on your door using fresh foliage and natural materials from our woodland garden. All materials supplied just bring secateurs and an apron. No previous experience necessary. If you hold a valid Fairhaven Membership, please pop in or call us to book your tickets.